Want to display or send SSTV transmissions? 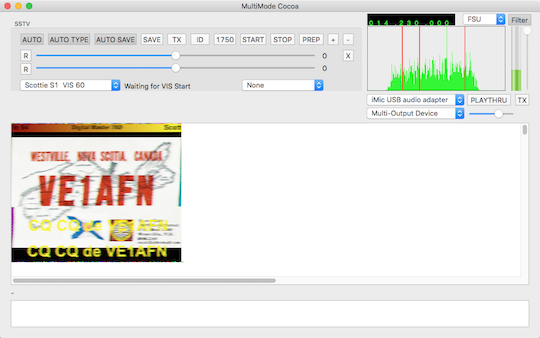 MultiMode Cocoa lets you decode and display Ham (Amateur) Radio SSTV (Slow Scan TV) transmissions. Just connect your computer to an HF radio, tune in an SSTV frequency, and watch the pictures. MultiMode Cocoa decodes all of the popular SSTV modes, including Robot, Scottie, Martin, and more. Some modes are receive only. Received images can be saved - including automatically as they are received. You can leave the app running unattended, and come back to view all the received images. You can also transmit images of course, taken from your saved photos or taken with your computer's camera. Text, such as your callsign, can be added to the sent image.